About Dr. Artemis Morris, N.D., L.Ac. Dr. Artemis helps people understand how their bodies work so that they can achieve lasting, sustainable health. This approach can save you thousands of dollars each year by limiting unnecessary medical spending and focusing on treating the cause — not just the symptoms — for optimal results and the best in preventative healthcare. Dr. Artemis Morris completed her Naturopathic Doctorate at Bastyr University in Seattle, Washington. Dr. Artemis Morris is licensed and board certified in Naturopathic Medicine. She also has a Masters in Acupuncture from Bastyr University, is a licensed Acupuncturist, and holds a Diploma from the NCCAOM. Dr. Artemis is devoted to research in natural medicine with a concentration in the traditional Mediterranean Diet and functional food. 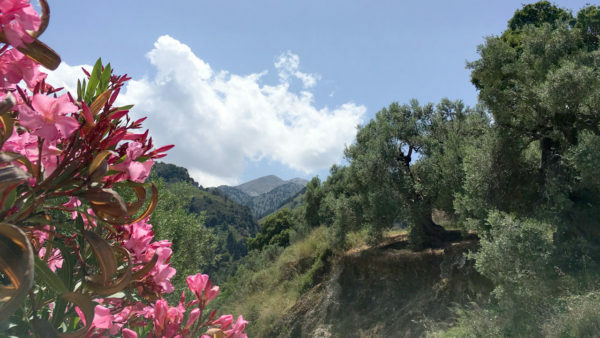 She conducted a clinical study based on the ethnographic research she did on the traditional Mediterranean Diet of Crete which she began for a doctoral study program through the University of Lancaster, UK. She is working on a book based on the Mediterranean Diet and did a clinical study on its effectiveness for the prevention of chronic disease. She has lectured on the Mediterranean Diet for Yale University and the American Association of Naturopathic Physicians and enjoys presenting on various health topics. 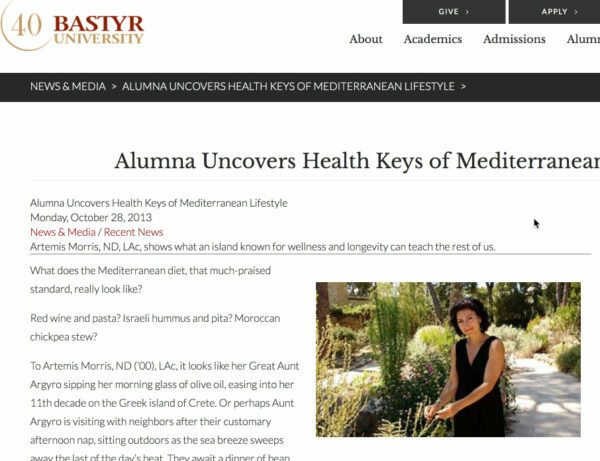 She is a consultant for Mediterranean Living. Dr. Artemis is the coauthor and was technical advisor on the book called The Anti-Inflammation Diet for Dummies for the popular ‘for dummies’ series. The book teaches how to eat in a way that reduces inflammation, which is the root cause for a number of medical conditions, including heart and cardiovascular disease, diabetes, cancer, autoimmune disorders. Dr. Artemis dedicated the book to her patients for demonstrating to her the most clinically effective way of treating inflammatory disorders naturally. Dr. Artemis is the medical director and founder of Artemis Wellness Center, an integrative medical practice in milford, CT. Dr. Artemis has served as the director of the holistic wellness center at Masonic Healthcare Center, the largest non-profit geriatric center in CT and was the founder and medical director of a multidisciplinary integrative center in New Haven, CT. She taught Traditional Chinese Medicine for a Masters Program at Stamford Hospital and at the Open Center in NY and has taught advanced nutrition at the University of Bridgeport’s Naturopathic Medical School. Dr. Artemis is a professor of nutrition for the Masters in Nutrition Program at The University of Bridgeport. She is co-academic director with Dr. Bernie Siegal for the Masters in Integrative Health and Healing Program at The Graduate Institute. She is dedicated to educating her patients, colleagues, and the general public about natural and integrative medicine and creating collaboration in the medical community for optimal healthcare. Her specialties include women’s health care (PCOS, Endometriosis, Dysmenorrhea, etc. ), fertility, Diabetes, nutrition, autoimmune disorders, and stress management. She was a charter member of the fertile soul work by Randine Lewis, phD, L.Ac. She supports her patients in their healing process by utilizing a combination of current conventional medical assessment and testing, sophisticated functional medicine and naturopathic clinical assessments, individualized nutrition and nutraceutical plans, Acupuncture, and craniosacral therapy. She believes that everyone can achieve health and wellness and works with her patients to stimulate their vital force and prevent disease using a patient-centered model of healing. Benefit from an integrative treatment plan that combines the best of modern medicine, clinical nutrition, acupuncture, expert advice on herbal medicine and nutritional supplements, and lifestyle guidance uniquely for you.